What seems to be of critical importance to good nutrition is the need to keep the ratio of plant to animal foods at a high level. For Westerners, this means a switch from using foods from animal sources as the center of their meals, to using them as a side dish, or even as a condiment. The basic premise of any good diet is variety, balance, and moderation. What seems to be of critical importance is the need to keep a high ratio of plant to animal foods. There is ONLY one way to get the benefit of Phytochemicals. 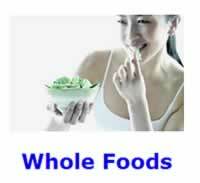 You have to eat a diet that is rich in fruits, vegetables, legumes, and whole-grains. Only you can make the tough choices it takes to change the food that you put into your body. In addition, only you can choose to release the wonderful healing power that Mother Nature has given to every one of us. Fruits, vegetables, legumes, and grains are edible plants that are full of nutrients, vitamins, fiber, and phytochemicals essential for good health. Hundreds of studies have established that diets high in plant-based foods are associated with lower rates for lifestyle diseases. Phytochemicals give plants their color, flavor, smell, and texture. They are plant chemicals that have health-related effects. As plants evolved, they developed antioxidant compounds, which afforded them protection from molecules of highly reactive oxygen, as well as other biochemical defenses against bacteria, fungi, viruses, and damage to cell structures, such as DNA. There is ONLY one way to get the benefit of these Phytochemicals. You have to eat a diet that is rich in fruits, vegetables, legumes, and grains. "There are many biologically plausible reasons why consumption of plant[-based] foods might slow or prevent the appearance of cancer. ... Consumption of diets low in plant[-based] foods results in a reduced intake of a wide variety of those substances that can plausibly lower cancer risk." Remember, only you can make the tough choices it takes to change the food that you put into your body. In addition, only you can choose to release the wonderful healing power that Mother Nature has given to every one of us. The basic premise of any good diet is variety, balance and moderation. Good nutrition is a journey, NOT a destination. What you ate last week is ancient history. Eating Healthy is a battle that you face now, and will face every minute of the day, till you die. Eating healthy means improving your current diet gradually and slowly over a long period to the point where eating healthy becomes routine and pain free. The Perfect Diet is your goal, but NEVER reality. There will always be room for improvement. The health principle of moderation applies to nutrition and eating food. EXCESS -- All healthy foods when eaten to EXCESS can be bad for you, and even toxic. And, may even lead to serious health conditions, like hypothyroidism. In order to achieve variety, many people end up eating excessively. Forget about what portions sizes are supposed to be. Think real small, or maybe a couple of tablespoons of each different vegetable. Most people can obtain recommended intakes of nutrients in a 3,000 calories a day. But, 3,000 calories a day is clearly excessive for the low activities levels typical of modern life. MODERATION -- The Goal is to eat a variety of healthy foods at a total caloric rate that will either maintain, or achieve your ideal body weight over a reasonable period. Most people can obtain 80% of the recommended allowances of nutrients in a 2,500 calories a day diet. Getting 100% of the recommended allowances of nutrients in only 2,000 calories, a day is certainly possible. But such results do not come automatically. It takes a great deal of effort to get all your nutrients from your diet. DEFICIENCY â€“ Characterized by poor variety that accordingly fails to provide minimal levels of nutrients. Anything less than 2,000 calories a day would certainly require supplementing a less than perfect diet. 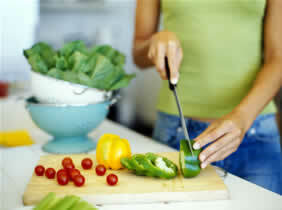 On 1,500 calories a day most people can obtain ONLY about 50% of the recommended intakes of nutrients from their diet. EXCESS -- Obsessing over eating only organic, fresh foods or home cooked is non-productive. Nor, are they required for the earlier stages of good health. MODERATION -- The Goal is eating an adequate mix of Whole-Foods and minimally processed foods that contain an abundance of plant food factors, referred to a phytochemicals. ORGANIC -- Once you have achieved the highest levels of wellness possible from having achieved variety, balance, and moderation in your daily diet , THEN and ONLY then would you be in a good position to benefit from the improved quality of organic foods. DEFICIENCY -- Characterized by consuming mostly Junk Food. Variety -- Variety means that we should eat a mixture of foods across the range of food groups and a mixture from within each food group. EXCESS -- Excess comes about by trying to include too much diversity in your daily diet. Variety is balanced over an entire week. Excess daily variety results in excess total caloric intake. MODERATION -- The Goal is achieving adequate biological variety. Ideally, you should eat between 20 and 30 different plant-based foods a week. To ensure an adequate intake of essential nutrients and other factors in food important for health that are currently not regarded as essential nutrients. To dilute potential adverse food factors. DEFICIENCY -- No single food can provide a nutritious and healthy diet. Foods from similar biological sources in nature have common nutritional characteristics. Less than ten (10) biological sources mean inadequate food variety. Do NOT eat Junk Food or Fast Food. Eat sparingly red meat, poultry, and dairy products. Meat and poultry should ideally be served as a condiment to meals, never as the main course. The factory farm raised meat and poultry that is being sold in the typical grocery store is NOT very healthy for you. ORGANIC -- Once you have achieved the highest levels of wellness possible from having achieved variety, balance, and moderation in your daily diet , THEN and ONLY then would you be in a good position to benefit from the improved quality of more expensive organic cuts of meat from free-range cattle, and exotic animals like buffalo. Dairy -- Is an exception, where higher costing organic free range products will benefit most people, no matter what their circumstances may be. There are plenty of good food sources of calcium, other than dairy. Eggs -- If you are going to eat eggs at all, why not go for the higher costing omega-3 organic eggs? Omega-3 eggs are mainstream, and are commonly available in many grocery stores. Cheese -- Consider the low-fat varieties of cheese. Milk - While drinking milk is probably okay for children with growing bodies, it is unnatural for a mature adult to be drinking the milk of another species. Moreover, growing children do better on a higher fat diet. Eat 2 to 3 servings a week of fatty fish (salmon, mackerel, sardines, herring, albacore tuna). Extra Virgin Olive Oil - Buy small bottles of olive oil with a green color to it, preferably with an Italian certificate of purity. Genuine unadulterated olive oil is expensive, so beware of bargins. Coconut Oil - You should use Coconut Oil for cooking and sautéing in a frying pan. Calling it an oil is really a misnomer. It comes in big wide mouth jars that is solid as a rock, at room temperature. You need to use a spoon or a knife to shave off shavings of coconut oil to drop into a frying pan to melt. A health grade Canola Oil purchased from a health food store. Peanut Oil - This oil is unhealthy, but is good for unhealthy deep-fat frying. Eat an abundance of plant-based foods. Wherever possible eat seasonally fresh and locally grown foods. Vegetables and fruits in nutrition are loosely distinguished by the need for cooking Vegetables, while fruits may be eaten raw. But the distinction is imprecise and often fails to be totally consistent. Eat two to three fresh salads each week. Most food from plant sources should be consumed cooked, in order to neutralize any toxins that they may contain. Serve fresh fruit as the typical daily dessert. Contains a chemical that reduces the efficiency of the liver ability to detoxify all kinds of toxins. Potatoes should be avoided as a Core Food. The small hard seeds of cereal grasses, such as wheat, rice, oats, and corn which are often ground into flour. Corn should be avoided as a Core Food. The carbohydrates that should form the keystones of a healthy diet come from whole-grains, like brown rice or oats, from foods made with whole-grains, like whole-wheat pasta or bread, or from beans. Legumes are plants belonging to the bean family. They refer to seeds that grow in cases called pods. They considered are legumes, when cooked without the pods. But when cooked with the pods they are considered to be a vegetable. Nuts are the fruit of certain trees and shrubs (ex., almond, walnut, hickory, beech, filbert, etc), consisting of a hard shell enclosing a seed. Peanuts are a legume, NOT a nut. Peanuts, peanut butter, and peanut oil should be avoided as a Core Food. They have some nasty health characteristics that are best avoided, if possible. The combination of 'Legumes & Nuts' along with a 'Grain' provides for a complete protein source. Based, in part, on the historical reality of the traditional Cretan Mediterranean Diet. There is a vitamin D revolution going on. Adequate vitamin D supplementation more than doubles the amount of calcium that you can get from a healthy whole food diet. "The data support the conclusion that a rice and bean diet is a well balanced food combination and can serve as a fairly good source of protein for the adult human."